Forum Index > Historical Arms Talk > Schiavona used by Scots? Posted: Mon 28 May, 2018 4:57 pm Post subject: Schiavona used by Scots? I know when most people talk about the Scots its the Basket hilted broadsword. I tried searching for Schiavona in Scotland. I know it is mostly considered a Germanic and Slavic weapon, but is there any evidence of Scottish soldiers/mercenaries using the Schiavona? As far as I know and in general, no, they were not used there. That isn't to say some example or another didn't find its way there, but as a general rule of usage, the answer is no. Similarly constructed basket-hilted swords like this Germanic Basket-hilt are located in Scotland's museums. Located in the Museum of Border Arms and Armour, Scotland. There were large numbers of Scots who went to Europe as mercenaries, starting fairly early on but in larger numbers in the 16th, 17th and 18th centuries. These soldiers were certainly exposed to the armament of different nations and it is not too difficult to imagine that, being professionals, they weighed and evaluated the tools of their trade. I have thought, and there are more learned folks than me have said, that the schiavona might have provided impetus in development of the Scottish basket hilt. That is not too much of a stretch IMHO. Why there are not more examples of these swords in Scotland, I do not know, except that mercenaries tended to stay where they ended up when the wars were over. A lot of Scots settled in Poland, for example. In addition there were Scottish merchant ships calling in European ports, and especially in Poland, during the 15th century. If they did not bring many schiavonas back to Scotland, they may have brought enough examples to interest Scottish sword makers in developing the Scottish style of basket hilt. Just speculation but it could have happened. I have thought, and there are more learned folks than me have said, that the schiavona might have provided impetus in development of the Scottish basket hilt. That is not too much of a stretch IMHO. My only issue with this is that the construction methodology of a schiavona vs. a Scottish basket-hilt is quite different. 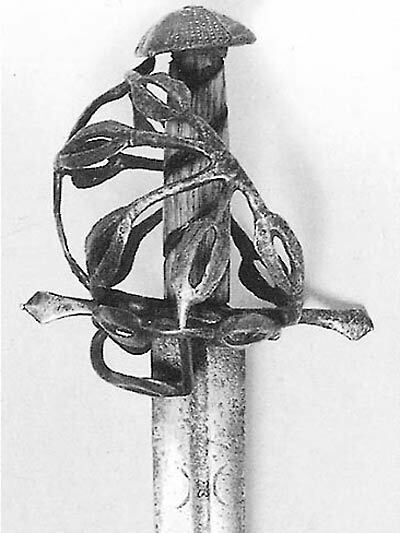 A schiavona, for example, has its basket directly attached only at the cross-guard whereas other basket-hilts are more often constructed with bars attaching to or under the pommel. Is this enough to disqualify the possibly? Of course not, but it does raise some questions. I also am of the opinion that the baskets of Scotland and England have little influence from the Schiavona or any other continental basket. As Nathan pointed out, the construction is very different. I may post more specifics on this later. 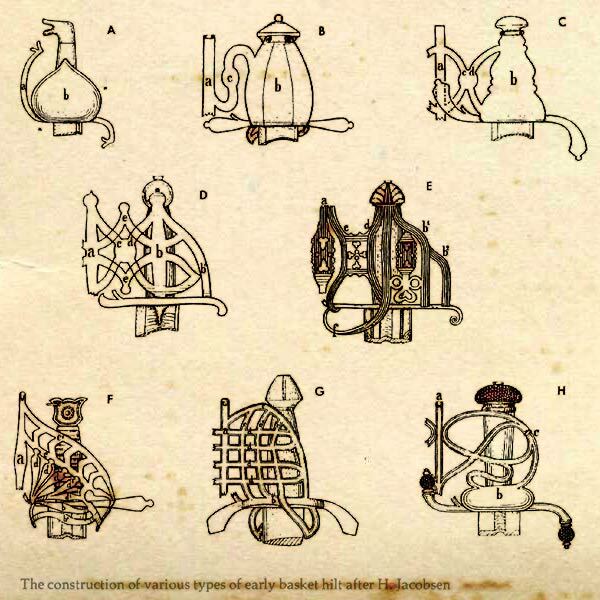 Here's something else to consider: the earliest English baskets are from the 1540s or so, and towards the end of the century the basic English/Scottish hilt that we recognize today had pretty much been established (details are different on these hilts when compared to the later Scots hilts, but the basic construction of the hilt elements are in place). How early are Schiavona? Late 1500s, as I recall, and so are too late to influence the direction and development of English/Scots baskets. Armour Class's "schiavona" doesn't really look like any historical schiavona I've ever seen. It's just got too many inconsistencies and is certainly not an "early" type by any stretch. It's a simplified and modified version of an authentic sword hilt, which some modern makers have decided to call "early" but this is simply not consistent with extant examples. So I've been reading "Broadsword Academy, 2nd ed. by Christopher Scot Thompson. He makes the statement "Some Schiavonas did find their way to Scotland, but the earliest Highland Basket hilts Predate them." I know this is maybe nitpicking, but he also has a foot note for the paragraph, referencing "Culloden: Swords and the Sorrows", The National Trust for Scotland, 1996. Consulted a copy of The Swords and the Sorrows. Mr. Thompson may be referring to a sword on page 45, fig. 1:47. The hilt on this one does resemble that of a Schiavona, but the text does not call it that, nor does it provide an origin or age for the sword. What appear to be actual Schiavonas made it to Scotland over the years, and Ancient Scottish Weapons by James Drummond illustrates two which he identifies as "Venetian" and two others which also look like Schiavonas which he just refers to as "swords." My earlier post regrading Schiavonas was meant to convey that early hilt makers might have had their styles influenced by Schivonas brought back, not necessarily construction techniques. However, I do stand corrected on that. No problem, I saw that and thought I'd ask on here (especially with the foot note). Thanks.